December luncheon at Louis’ Basque Corner — Saturday December 15, 2012 at 11:30 am the SNU lunch will be at Louis Basque Corner in Reno. The restaurant is located on the corner of Evans and East 4th Street. Please rsvp to the SNU at hq@sierranevadaairstreams.org or call 775 972 5011 no later than December 10, 2012.
lifehacker had a couple of interesting ideas this morning. One is to cut a slot and mounting holes in a leftover piece of plastic pipe so it can serve as a plastic bag dispenser. The other idea is about peeling potatoes for mashed or perhaps potato salad use by boiling until they are cooked, immersing in ice water until cool enough to handle, and then just rubbing off the peel. The bag dispenser looks good for those bags that come on a roll. You’d need a 2 or 3 inch pipe such as used for drain pipe. Cutting the slot for extracting bags one at a time could be a challenge without the right tools. Or you can see the Amazon search for garbage bag dispensers (Amazon affiliate link) if you don’t want to roll your own. If you’d rather, you can use a device for potato peeling. See Potato peeling (Amazon affiliate link) for some ideas. The other option is to just leave the peel on the potato. It is supposed to be good for you (see nutritional value or Wonderful Health Benefits of Eating Potato With Skin On) — a lot of this just depends upon the type of potato and how you choose to cook and serve it. The November Newsletter has been posted! Links to photo galleries and additional information mentioned in articles in this newsletter can also be found there, too. The SNU November lunch will be Saturday November 17th at El Charro Avita in Carson City at 11:30 am. El Charro is south of downtown Carson City off US 395 on the East side of the Highway. Please rsvp to the SNU at hq@sierranevadaairstreams.org or call 775 972 5011 no later than November 12. A front, the first of the season, timed itself for the rally planned in central Nevada. There were restrictions on highways early in the week so the rally was moved to a lower elevation that didn’t require travelling high mountain passes for most folks. 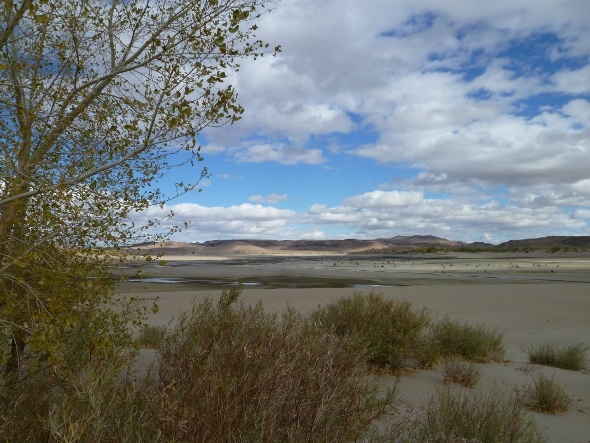 The Lahontan State Recreation Area was nearly empty except for one full-timer who had moved in from BLM lands so as to avoid getting his rig stuck in the mud that might result from the results of the front moving through. The reservoir was nearly drained dry after a long growing season irrigation needs.